The men were being paid to take part in the early stages of a trial for the drug to treat conditions such as rheumatoid arthritis and leukaemia until they were taken ill on Monday within hours of taking it. The hospital's intensive care director Ganesh Suntharalingam said the patients were admitted very quickly and were receiving "close monitoring and appropriate treatment". 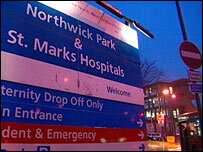 A Northwick Park Hospital spokesman said two were in a critical condition, while the other four were "serious but stable". Richard Ley, spokesman for the Association of the British Pharmaceutical Industry, said: "This is an absolutely exceptional occurrence. I cannot remember anything comparable." The Medicines and Healthcare products Regulatory Agency (MHRA) immediately withdrew authorisation for the trial. An international warning has also gone out to prevent it being tested abroad. Its inspectors will visit the research unit and it is in contact with the local strategic health authority, the Department of Health and police about the cases. Healthy volunteers are used to test the safety of the drug in "phase one" of the trial before further tests with people who have the condition to determine whether the drugs work. Professor Herman Scholtz, from Parexel, said the clinical research organisation had followed regulatory, medical and clinical research guidelines during the study. He said: "When the adverse drug reaction occurred, the Parexel clinical pharmacology medical team responded swiftly to stop the study procedures immediately." He added: "Such an adverse drug reaction occurs extremely rarely and this is an unfortunate and unusual situation. Have you taken part in a drug trial? How did you find the experience? Would you consider taking part in one? Have you conducted a drug trial? Send us your comments and experiences.